Chiff and Fipple Forums • View topic - embouchure on Anasazi flute? Post subject: embouchure on Anasazi flute? OK, I've posted this one before Intro to Rim-blown flutes. This guy says the original flutes had a rim all the way around the top and were played on the side of the mouth, though he uses a notch like a shakuhachi and plays it on the front of his mouth. This guy says this type was and always should be played on the side of the mouth, and claims a better sound that way than playing it in the front. He certainly does, but the other guy gets a better sound at the front, so it may depend more on what you're used to. They both claim that the style with no notch is traditional, which seems to be borne out by pictures of flutes from the broken flute cave. So, do any of you actually play Anasazi/Basketmaker/Pueblo flute, or it's more recent relatives such as Hopi or Mojave? Love to hear some advice from experienced players. Or, failing that, wild speculation from opinionated players. Pardon my pessimism about finding the former on this board, but I've been told it's more TRAD centric. Surprise me! Post subject: Re: embouchure on Anasazi flute? From me, opinions you can get. Have you looked into the Ney at all? That takes the (presumably) same sideblown technique you describe, and the instrument is very much alive, so perhaps you could check what's out there for tutorials. I don't know much about it myself, but one thing I do recall reading is that in Ney technique, both lips are used. Crazy. As you know I am about to embark on making some Anasazi flutes, with an emphasis on having the original rim with no notches or other modifications. Such changes affect the sound of flutes a lot. But as for playing on the side rather than the front, I think it's entirely up to what the player wants to do. As long as the air reed is split into two and forms vortices to set up sustained standing waves in the tube, I can't see that it matters. I notice a lot of Low D Whistle players play on the side also. I play mine front on, and can't get a sound out of it sideways. I think it depends on your mouth and teeth. Whatever way you can get the right embouchure for a good tone, go for it. I myself am more concerned about the cut or lack thereof on the rim as affecting sound quality than how the instrument is held. I am sure you can get a good sound side on or frontwards. We will have to ask Kokopelli. I haven't looked at the Ney purposely, but I did watch a tutorial on rim-blown flutes from a guy in Germany, who basically classified the Ney, the Kawala, and Pueblo or Anasazi flutes in the same category and to be played the same way. He said sideblown is the natural way to play all of these. He demonstrated that he could get a clearer tone sideblown than straight on, but it's possible that's just because he's practiced that more. Frank Harter from Raven Wing flutes agreed that sideblown is the traditional way to play, but he got a better tone straight on with a notch. I will definitely look more closely into the Ney and see what I can learn. Thanks. ...sideblown is the traditional way to play, but he got a better tone straight on with a notch. I've done a bit of looking around, and it appears that even in the hands of the best players, the ney, kawala and bulgarian kaval all have a hiss to them. If someone has overcome this, I haven't found it yet; it may just come with the territory. I agree, I find pretty much all the sideblown music to be a bit breathy. Actually I think I could manage that kind of flute, although it seems, like boehm flute, they might take a lot of air. ...although it seems, like boehm flute, they might take a lot of air. The Boehm flute does not take a lot of air. Nor does any other kind of sideblown flute, so long as it's well-made; the issue lies with the player's embouchure, not the instrument. If your embouchure is well-practiced and efficient, a Boehm or simple-system flute should take hardly more air than required for speaking and still play loudly even so, and I know this firsthand. Of course you have only my word on it, but trust me: it's true. It's all in the lips and their control of the air jet. So the instrument in itself does not require a lot of air; it's what you do with that air that counts. One would assume that with practice, the kaval player's embouchure can also become similarly efficient. I seem to recall that you bought a Boehm flute not so long ago. If you find that it takes a lot of air for you to play it, it's just that you're new to it and haven't developed your embouchure. It can take some years to really nail this, and there's no getting around it; these things don't play themselves. Just because you can get a noise out of a flute, it doesn't mean you're doing it right. When you practice your flute - any flute - always be very mindful of your embouchure and approach it with endless investigation, because for a long time - maybe forever - there will always be a better way. I contrast the kaval's hiss to playing such as this. I'm entirely convinced that the kaval's hiss has everything to do with the embouchure method, and that consequently it cannot be avoided. You seem to have mistaken this hiss to be a variant of the breathiness you have alluded to (and with rather a broad brush too, I might add) in your assessment of other instruments, but from where I stand it is not the same at all, and in that, you have mistaken my drift as well. As I might have mentioned, I've looked and looked, and even master kaval players have this very audible hiss, and it's quite different and more omnipresent than any passing breathiness you might come across in sideblown flutes where, with good players, breathiness is not a given but would be incidental, if at all. As the link illustrates, the sideblown flute doesn't have to have such a steady hiss as is found with the kaval, and in both cases that is definitely due to how the lips are used. 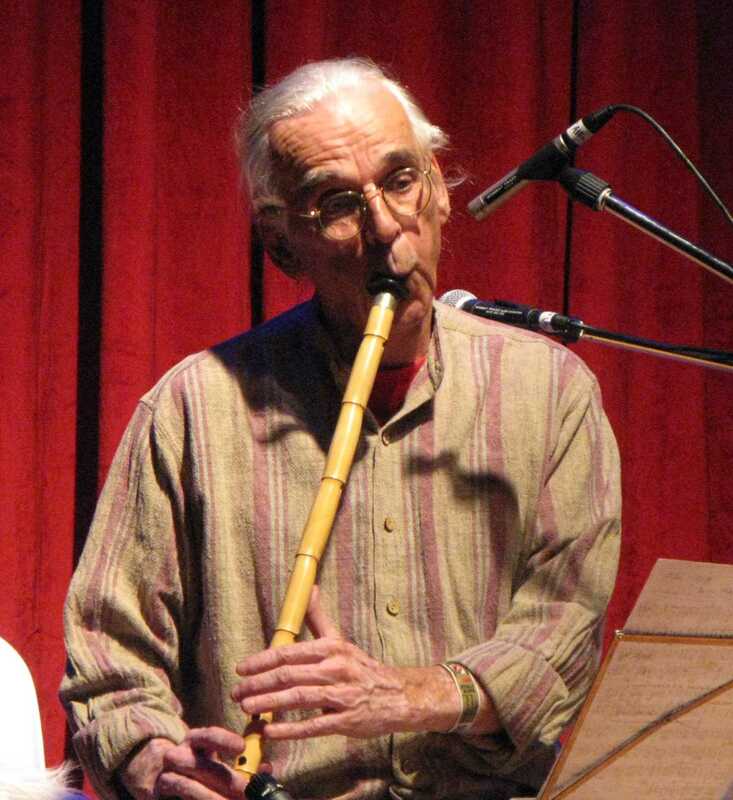 In comparing the kaval to the sideblown flute, when we're discussing the player's embouchure, it's apples to oranges. Don't underestimate the importance of this difference. I think that one should consider the kaval's hiss to be an integral part of the whole beast. With sideblown and notched flutes, it ain't necessarily so. Thanks for the clarification Nano, I think we're actually agreeing. That "hiss" you describe is the same as I was hearing, but less accurately describing as "breathy." And remember, in this context, "sideblown" refers to holding the flute at the side of the mouth and blowing onto the rim, as is customary with the ney or kaval. We're not discussing a transverse flute in this thread. And remember, in this context, "sideblown" refers to holding the flute at the side of the mouth and blowing onto the rim, as is customary with the ney or kaval. We're not discussing a transverse flute in this thread. Then you need to stipulate your terminologies beforehand, or find clearer ways to state your case, because up until your usage here, "sideblown" has always been customarily interchangeable with "transverse" when referring to flutes. Regardless of embouchure technique, the kaval and its relatives are categorically termed "endblown" or "rim-blown" (I personally find "endblown" the clearer of the two). You will of course understand my confusion of your meaning, and I daresay I will not have been the only one. I've done a bit of looking, and so far I can find no concise term for the distinguishing ney/kaval embouchure technique. "Bilabial" might be a start, but the corner of the mouth isn't taken into account. Then you need to stipulate your terminologies beforehand, or find clearer ways to state your case, because up until your usage here, "sideblown" is customarily interchangeable with "transverse" when referring to flutes. Regardless of embouchure technique, the kaval and its relatives are categorically termed "endblown" or "rim-blown" (I personally find "endblown" the clearer of the two). You will of course understand my confusion of your meaning, and I daresay I will not have been the only one. Quite true of course, and I have been working on it. Please chalk up my inexactitude to my having been a raw newbie when I started this thread. Andro and I were trying to describe things with which neither of us had any considerable experience at the time. Now you see our struggle. It is kind of sideways to the normal manner of playing an Anasazi/Basketmaker style flute, which just adds to the confusion. If you think of a better way to describe it, I'd love to hear. Here's another try: The medical term for the corner of the mouth is the oral/labial/buccal commissure. So, perhaps "commissural embouchure" could fly when you need to be specific, once everyone gets used to it. On further looking, neither the word nor the compound term seem to be in any use flutewise, so you heard it here first, folks! I suppose "corner embouchure" could work, too. Adding "-blown" makes for new difficulties; "corner-blown"? Maybe. I find the omission a bit strange, because we favor concise terminologies in our endeavors, and it's not as if the ney technique just popped up yesterday. You'd think that surely by now there'd have been at least one English-speaking academic specialist somewhere who would've pigeonholed it in a nicely-wrapped bit of jargon. But, apparently we layfolk have to do the heavy lifting instead. Maybe there are suitable terms in other languages, but I think a Western term is perfectly necessary too, if we're gong to avoid words like "sideblown" (an avoidance I recommend, as you can see from the misunderstanding it caused). OTOH, in this case the quest for brevity might prove harder than it's worth, in which case having to use more words than few isn't the worst thing that could happen. I’m no expert in the playing of the rim-blowns (end-blowns) without the notch/utaguchi. I can sometimes make “noise” that way (with a rolled or beveled edge) with my Anasazi or desert flutes, but not much more. I’ve always heard of the techniques as 1) interdental or, 2) oblique. My understanding is that the two terms actually refer to different methods of playing this style of flute. I’ve associated the “oblique” method with the flutes of the US southwest. Every example of playing a southwest flute that I’ve heard using the oblique method has been hissy sounding. I don’t know if it simply was those players, or the design of the flute. And unfortunately, no one knows how they sounded or were really played over 1200 years ago. 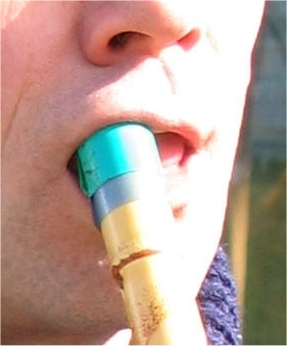 The interdental embouchure is most associated with the Persian ney, and directing the air by means of the tongue/roof of the mouth is the basis of the technique; the lips play no part in sound production. This seems to be the most common technique for endblown flutes; the lips alone direct the air. You can see that the oblique positioning is simply to get the center of both lips to the edge of the rim where the air stream gets split, and this creates the sound. This is the technique shown in Michael's pics above. Clearly, then, my suggested term "corner-blown" is something of a misnomer. If you need a concise term, I find myself liking "oblique" more and more. Oblique is certainly concise, but is it sufficiently descriptive? Perhaps "oblique end-blown" would contrast more effectively with "transverse," etc. Oblique does seem to be a subset of end-blown or rim-blown. I do think you're correct, "oblique" is better than "side-blown" by a wide margin.